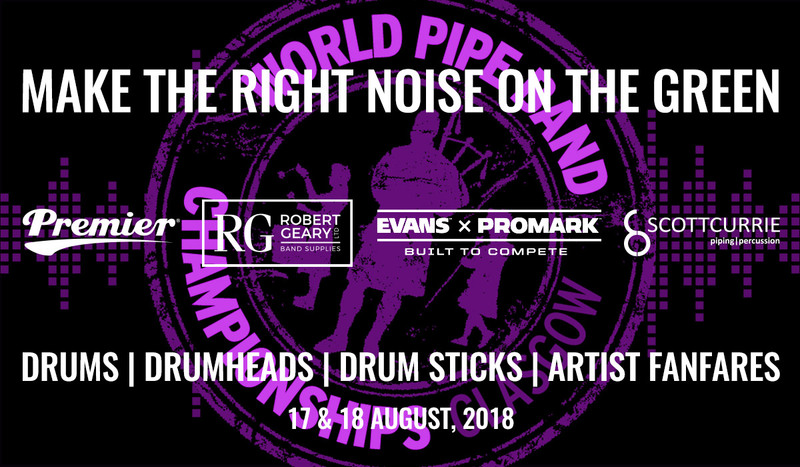 The World Pipe Band Championships is approaching fast, and along with our friends at Premier, Robert Geary Ltd, and D’Addario Percussion brands Evans Drumheads and Promark, we’re getting ready for our united brand and retail roadshow at Glasgow Green on Friday 17 and Saturday 18 August, 2018. You will be able to browse, try and buy Premier drums, the Evans PB SB1 Pipe Band snare drumhead, Promark Stephen Creighton PBSC snare drum sticks, accessories and brand merchandise, as well as meet the people behind some of the biggest brands and bestselling pipe band percussion instruments and accessories. One of the highlights of the event is always the Saturday afternoon artist drum fanfares, where several of the big name drum corps in contention for the famous champion’s sash treat you to up-close performances of their technical skills in action. We’re all very much looking forward to what is guaranteed to be a busy and noisy weekend of music and fun. We can’t wait to see you there!